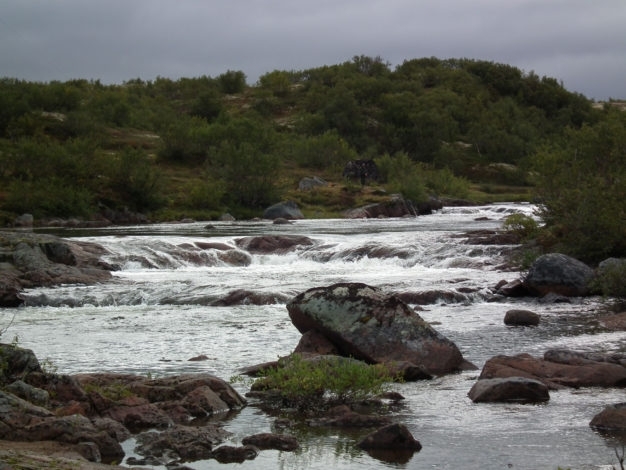 The Belousiha River on the Kola Peninsula was quite a find. 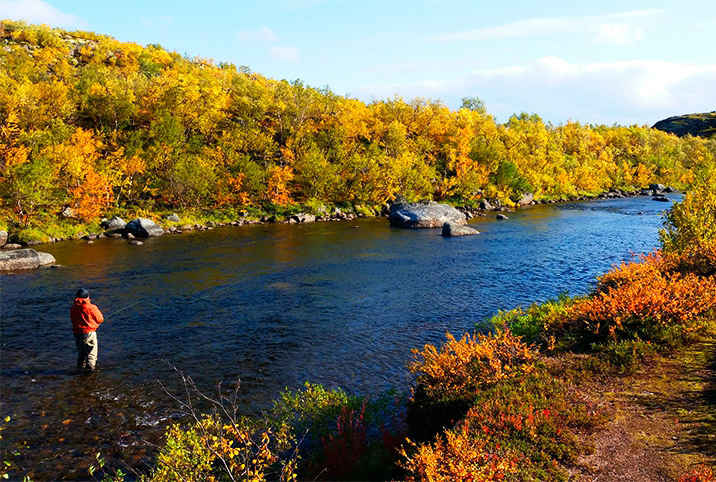 It's a smaller river, tucked away and overlooked for many years, only one hundred and fifty kilometers from Murmansk by car. Pretty much since the Kola became famous for fly fishing, anglers have flown right past it in helicopters bound for the other famous rivers to the south. 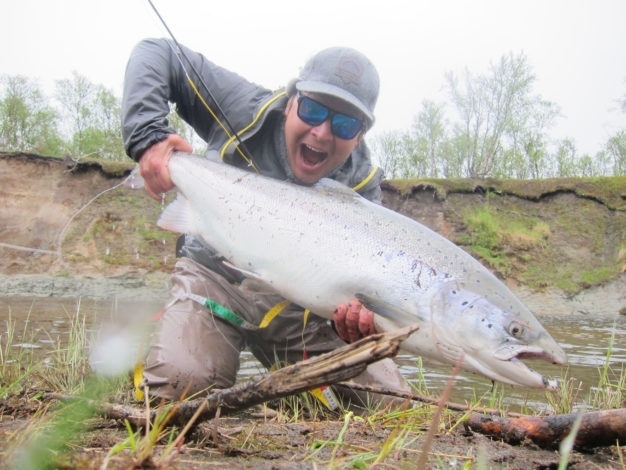 But as it turns out, the Belousiha has a huge run of salmon, and represents a unique environment within which to pursue them with tactics much more diverse than the usual spey stick "chuck n' duck-repeat". Plus, without the added expense of helicopter flights and competing for spots with the gentrified European crowd, Belousiha has turned out to be a value that's impossible to beat for foreign anglers traveling to the peninsula, and as such well worth checking out for anyone interested in a classic Atlantic Salmon experience. 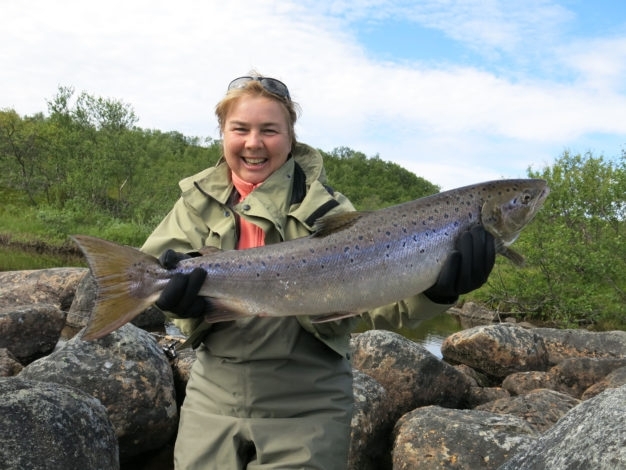 The fishing on the Belousiha and Voronya Rivers is much more diverse in its nature than what anglers familiar with other rivers on the Kola might be accustomed to. After forming high on the peninsula from a system of lakes just off the coast of the Barents Sea, the Belousiha flows through twelve kilometers of constantly changing gradients and structure before joining with the much larger Voroniya River below. 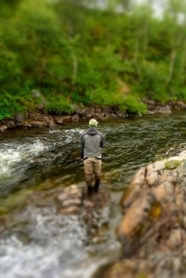 And Belousiha River Lodge sits right on the river halfway between its headwaters and the confluence. 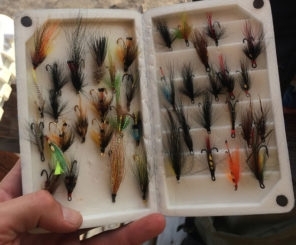 What this ends up meaning is that while there are definitely sections of the river where blind swinging flies is an effective technique, there are also many sections where sight fishing is not only possible, but decidedly effective. 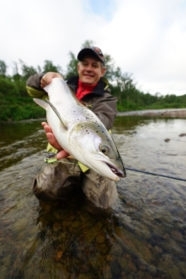 Beat rotation is designed to give every angler an equal chance to catch fish from the most productive sections of river. The 12 kilometers is therefore divided into 5 sections (beats) all of which are different in nature and fishing conditions. Beats alternate daily according to the agreed schedule. Each beat is limited to two rods. Although certain sections of the Belousiha fish well with double handed rods, single handers are perfectly adequate for most of the river. 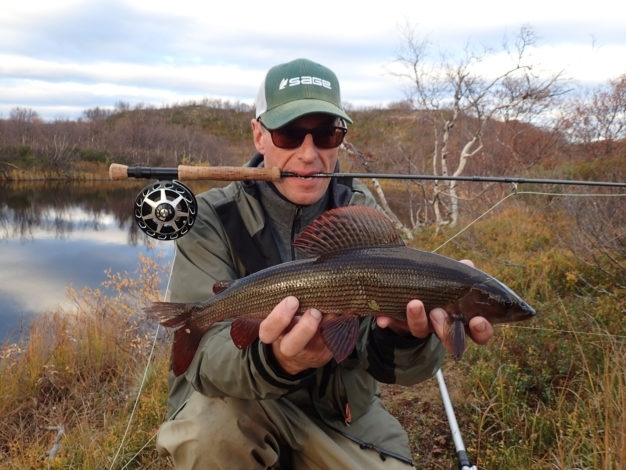 Many of our anglers bring switch rods to handle both types of water, generally in the #6 or #7 weight range. Choosing the right rod though is directly related to the time of year and water levels in the river. In the high summer months and at the end of the season, we suggest a light approach. The river is generally low at this time and the salmon often lie in mirror smooth glides, meaning that lines in the range of #4 or #5 and very small flies make much better presentations than do heavier ones, and as such are much better at producing takes. 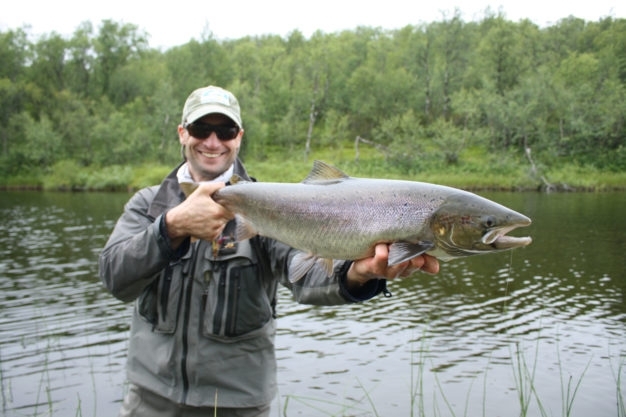 This sort of approach also makes for some very exciting battles, since anytime a 30"+ fish finds itself attached to a four weight the angler holding that stick is definitely in for a ride! Fly selection depends on the season. Almost all the well known patterns used on the Kola Peninsula can succeed on the Belousiha, but of course we have a few of our own as well that are tied specifically for this location. 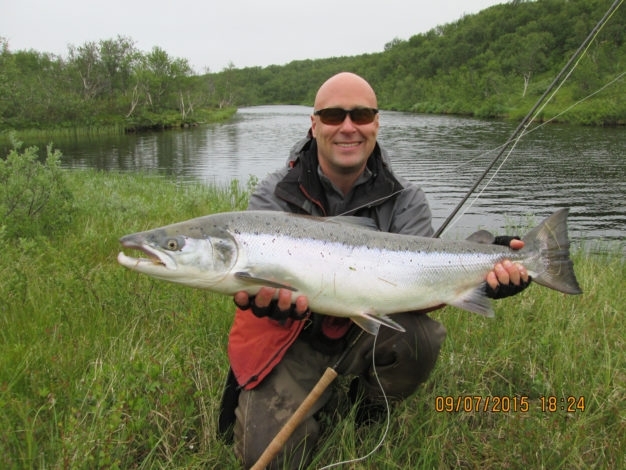 At the beginning of the season, when there is often big water, flies tied on copper tubes and tungsten cones work well. 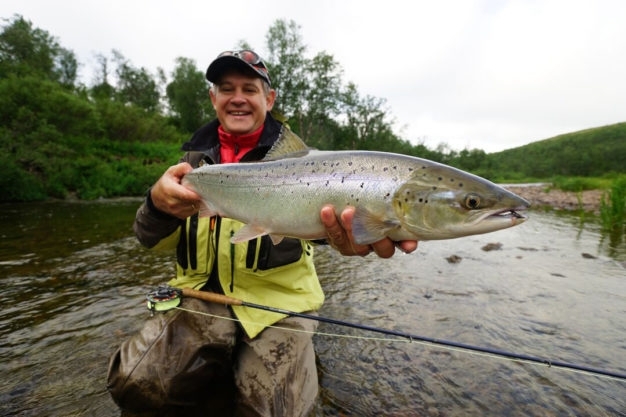 The river has a lot of deep holes with strong currents and a heavily weighted fly is sometimes essential to get down to where the fish are holding. 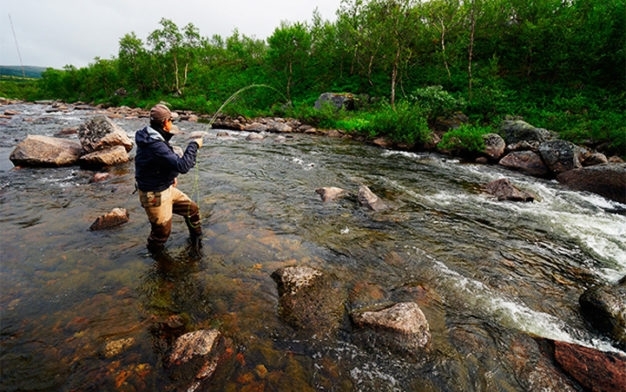 At any time during the season, anglers should be open to trying dry flies and ‘riffling hitch’ patterns. The river has many calm sections with wooded shores and smooth glides. In such places, surface flies often work very well. Early in the season heavier lines are advisable as larger flies need to be thrown into higher water. By summer though, things are quieting down and more delicacy is called for in our presentations, meaning #5 to #7 weight lines are the heaviest needed. Floating lines with various polytips will serve most situations but full sinking lines or sink tips can occasionally be pressed into use. During the late summer, when the river is low the wary fish react to everything that happens on the surface of the water. 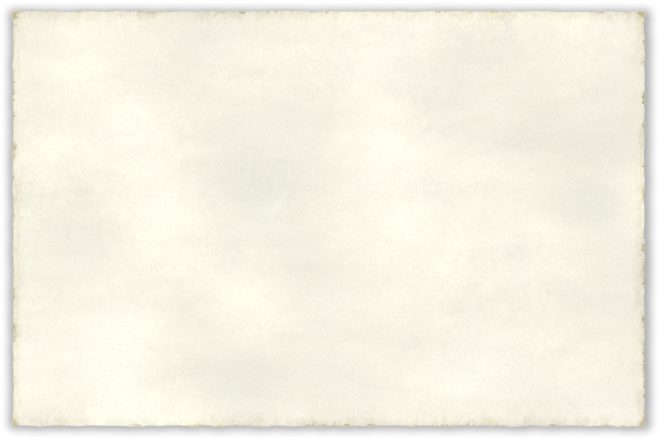 At these times, only a quiet presentation of the fly on the water will bring success, and lines as light as #4 are often employed. The Voronya is a classic, high-flow river almost designed for Spey anglers, dependent on water levels for access, but generally providing an excellent addition to the fishing on the Belousiha described above. 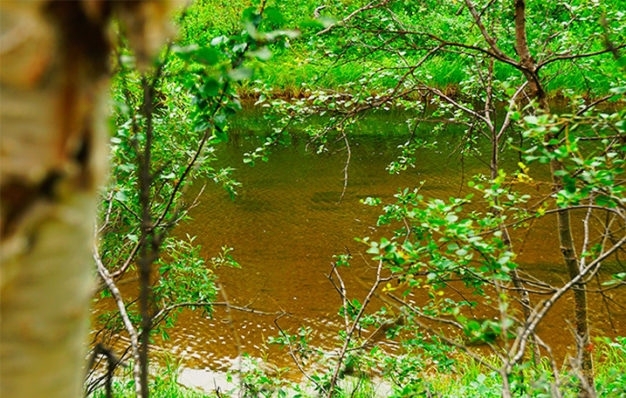 Belousiha River Lodge is a well built, simple, yet exceptionally comfortable property situated on a plateau of birch forest overlooking a deep bend in the river. Mornings and evenings usually provide great entertainment watching salmon rise to the surface of the pools directly below the dining hall. 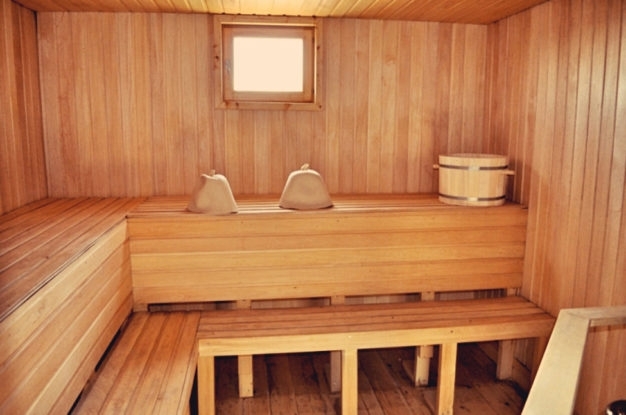 Quite welcome in such wild surroundings, the lodge offers 24 hour hot water, a beautiful cedar wood sauna, and all the requisite infrastructure for a pleasant and comfortable stay. There is also a communal dining room with fireplace where guests can relax, watch TV, or tell stories from their day on the river. 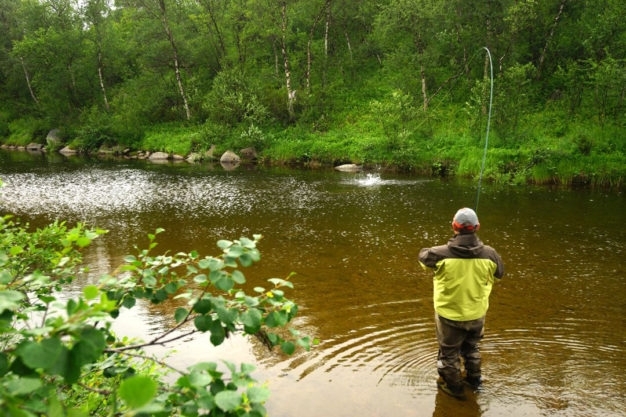 The camp's capacity is eight anglers. 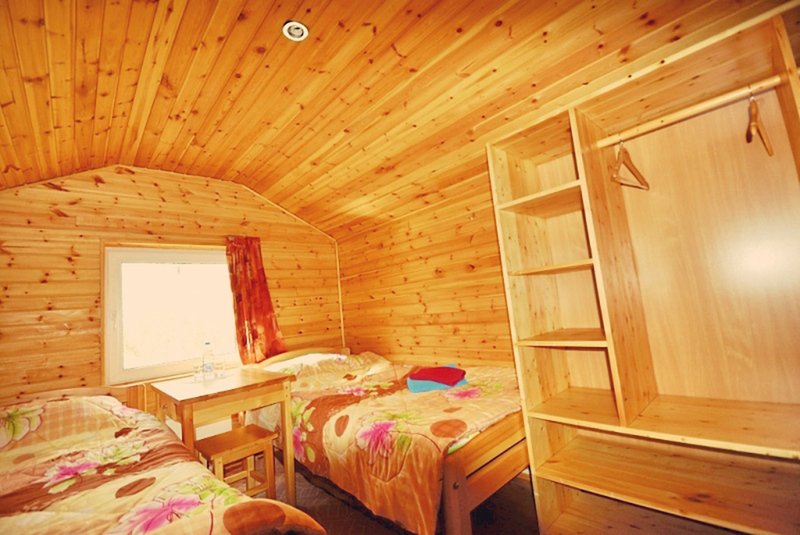 The rooms themselves are individual wooden houses, each equipped for 2 guests with separate beds. Heat is provided by both wood stoves and electric units. 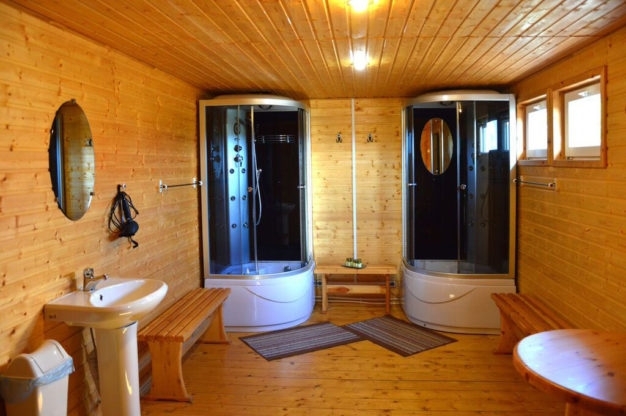 Additionally, we have just added a new lodge building with more contemporary designs, and guests can elect either option. Belousiha Lodge's chef and kitchen staff are trained in the classic formal Russian style, and serve simple while still excellent meals as a result. Both breakfast and dinner are served in the lodge dining house, while lunches are packed each day for enjoyment in one of several covered seating areas which have been built for that purpose on each beat of the river. 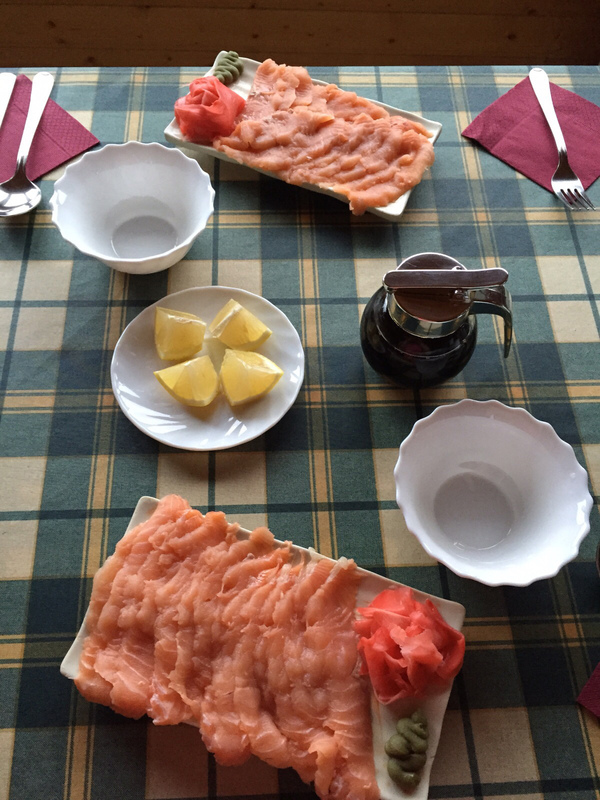 Cold cuts and soups are pretty much omnipresent standards for all Russian meals, as are fresh fruits and pastries, and dinners at Belousiha are typically three course affairs. 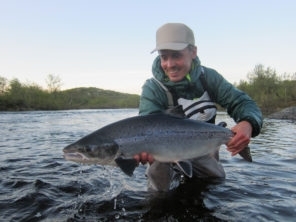 Flights for Belousiha River Lodge should arrive in and depart from Murmansk airport (MMK), generally through connection via either Moscow (DME) or St. Petersburg (LED). 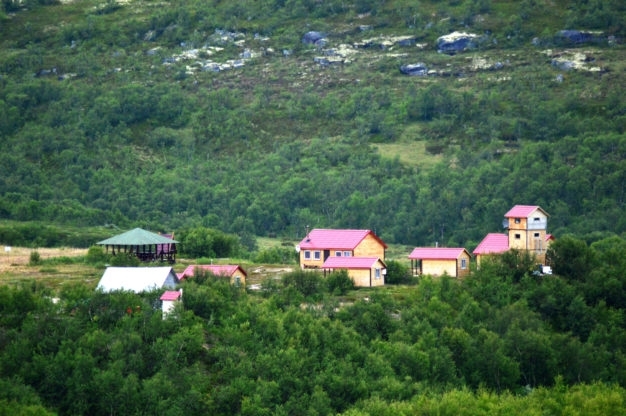 The daily flight to Murmansk arrives at 1pm, and a driver from Belousiha River Lodge will be waiting for clients at the airport at that time. Anyone needing to arrive prior to the beginning of the tour is welcome to contact us for reservations and ground transfer set up to a local area hotel. 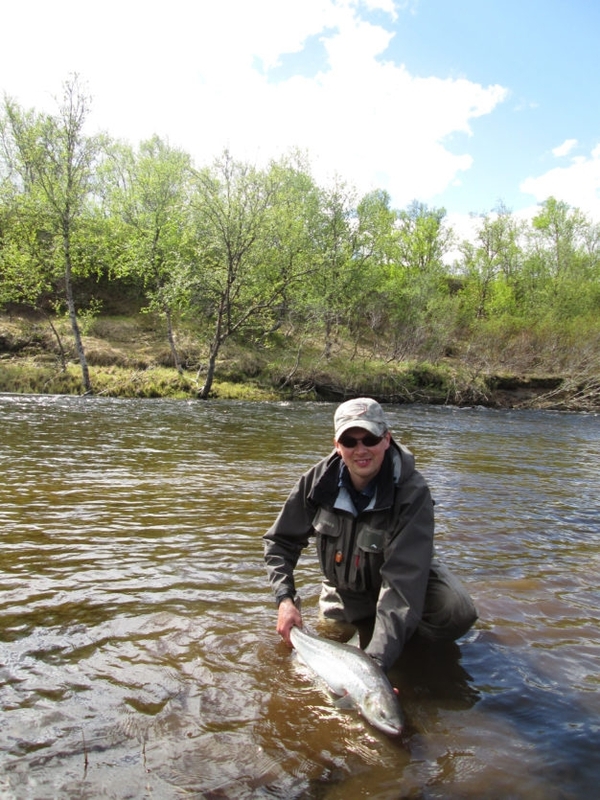 Upon leaving Murmansk clients enjoy a scenic two hour ride out to the lodge, where they will then begin their week of fishing. Ground transfers leave the lodge at 10am on the last day of the tour, arriving in time to check in for the daily departure flight. 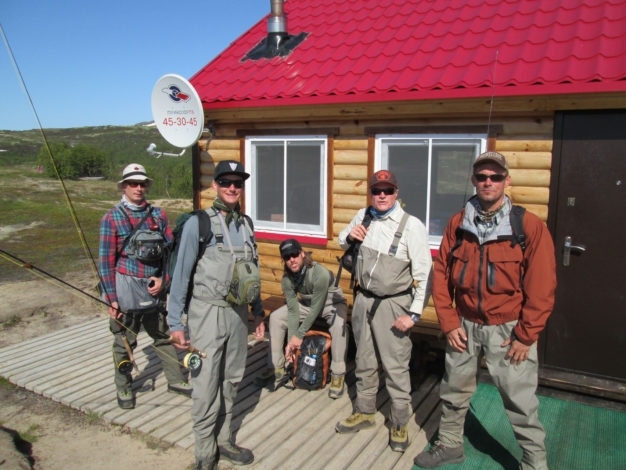 Our services are provided absolutely free; booking a trip through Hemispheres Unlimited WILL NEVER COST YOU A SINGLE PENNY MORE than booking it directly with the lodge or outfitter, but does reap the benefits of our extensive experience with that destination, as well as our ongoing support services available to you at any time prior to, during, or even after your trip. All pricing is quoted in Euros and will be converted to American Dollars at time of purchase based on the exchange rate that day. 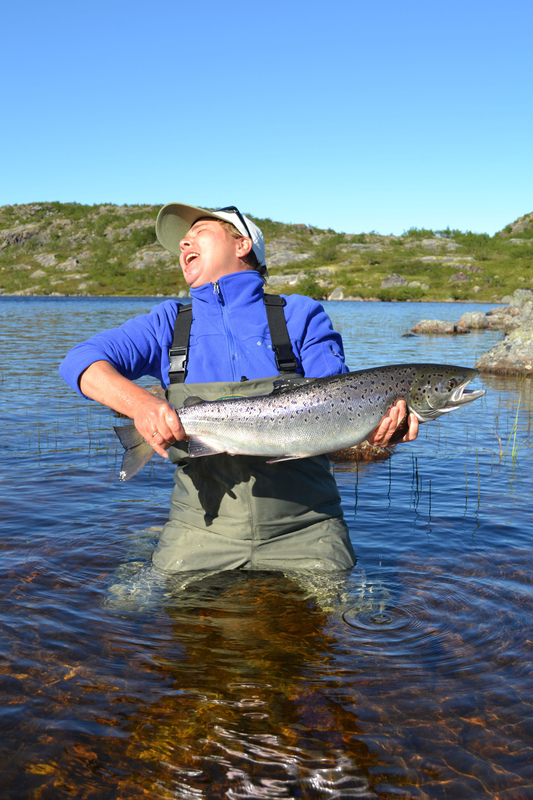 The price includes: Transfers, accommodation, meals, licenses, guides and fishing. The price does not include: fishing gear, alcoholic drinks, tips for the staff, accommodation in hotels in Murmansk, guide service in Murmansk or the acquisition of air and rail / train tickets. Luxury accommodation is available on a first come, first served basis. 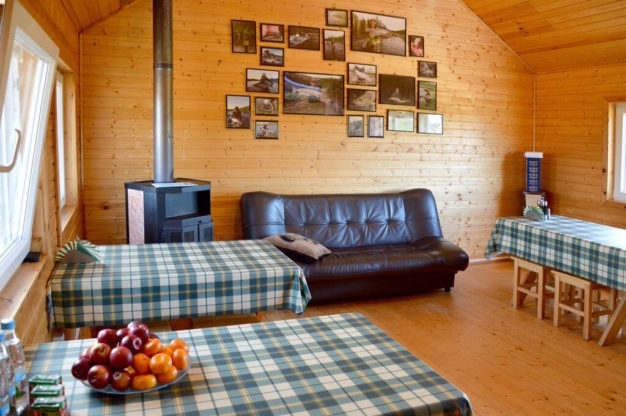 For an additional 500 Euros per person, two rooms are available at the lodge for two anglers per room. 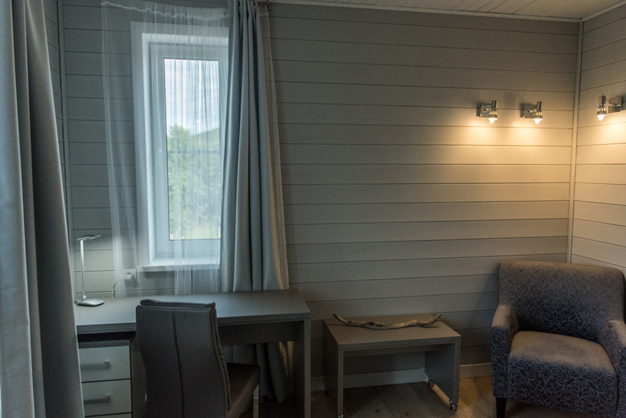 These spacious Scandi-style rooms each have an en-suite shower and toilet, plus an exclusive high speed Wi-Fi connection. 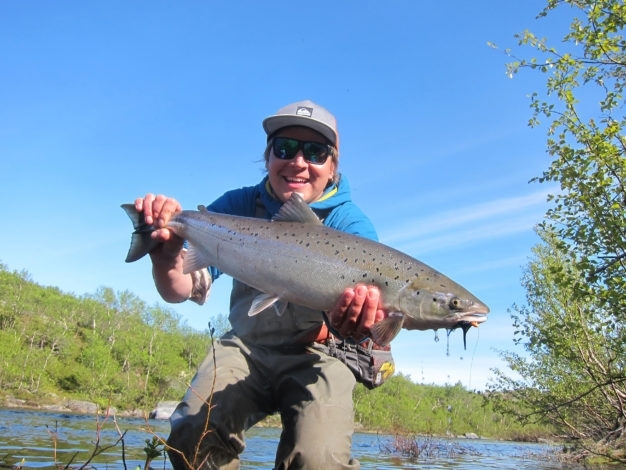 Contact us today for available dates and details, and to get started on your way to a classic Kola Peninsula experience of Atlantic Salmon on the fly!